The pilot of the police helicopter that crashed into the Clutha pub, killing 10 people, had received five low fuel warnings, a fatal accident inquiry has heard.At 22:19 on 23 November 2013, David Traill, who was among those who died, had told air traffic control he was returning to Glasgow City Heliport.At 22:22, the Police Scotland helicopter crashed through the roof of Glasgow's Clutha bar.Thirty one people were also injured.The court heard that at the point Mr Traill said he was returning to the Clyde heliport from Bothwell, the helicopter was estimated to have 86kg of fuel on board. Marcus Cook, senior inspector of air accidents at the Air Accidents Investigation Branch (AAIB), said that, as well as a warning unit, the pilot also had a screen known as a Caution and Advisory Display (CAD).It should have indicated the amount of fuel in the main tank, the left supply tank and the right supply tank.Mr Cook said: "The evidence suggests the CAD was functioning at the time. "The helicopter's warning unit had two indicators of note in relation to the fuel. They were "Low Fuel 1" and "Low Fuel 2". In October 2015 a report from the AAIB concluded the pilot did not follow emergency protocol and flew on despite the low fuel warnings.It also found fuel transfer pumps were turned off and a controlled landing was not achieved for "unknown reasons".And it recommended that all police helicopters should be equipped with black box flight recording equipment.More than 100 people were in The Clutha when the Eurocopter EC 135, operated by Bond Air Services, crashed into the bar. Pilot David Traill, 51; PC Tony Collins, 43; and PC Kirsty Nelis, 36, lost their lives along with seven customers who were in the bar on Stockwell Street.They were Gary Arthur, 48; Joe Cusker, 59; Colin Gibson, 33; Robert Jenkins, 61; John McGarrigle, 57; Samuel McGhee, 56; and Mark O'Prey, 44. The second day of the hearing earlier heard that AAIB investigators had received nothing "new or significant" enough for the original investigation to be reopened despite being sent various documents over the years.Philip Sleight, deputy chief inspector of air accidents at the AAIB, told the court that the AAIB's purpose was to investigate the circumstances of an accident and make recommendations with the intention of preventing a reoccurrence. He said the focus of the AAIB was "encouraging safety" not "apportioning blame". Donald Findlay QC, who is representing the family of Robert Jenkins, asked who the relatives could speak to about differences between the draft and final report.Mr Sleight said the differences could not be discussed because of regulations. Mr Findlay asked if the families of those who died just have to accept that. Mr Sleight replied "yes".Mr Sleight told the inquiry: "It is quite normal for a report to change significantly between draft and final." Mr Cook, who was part of the team that prepared the AAIB report, told the court about the communication on board helicopter.He said it was the responsibility of the pilot to liaise with Air Traffic Control. Separately, the Police Scotland Airwave system was used for operational purposes.He told the hearing both means of communication were recorded. The helicopter's last journey was traced by radar. It left Glasgow at 20:45 to respond to reports of someone being struck by a train at Oatlands. It then travelled to Dalkeith for a routine task before carrying out surveillance in Bothwell, Uddingston and Bargeddie.The FAI is being held in a temporary court at Hampden Park football ground and is expected to hear about three months' worth of evidence between now and August. It will not sit every day. 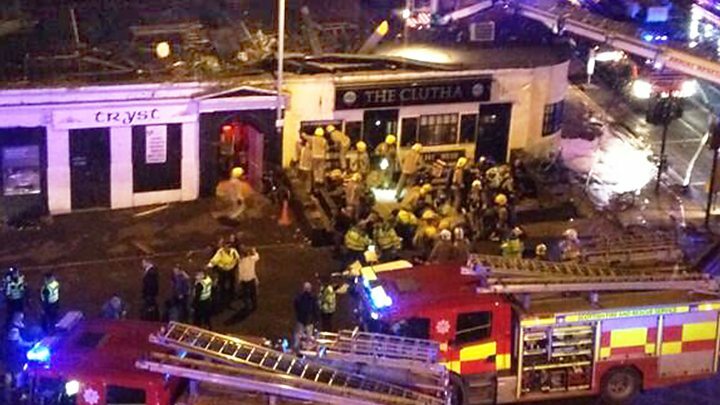 29 November 2013: Police helicopter crashes on Clutha bar in Glasgow, killing 10 people. 9 December 2013: AAIB preliminary report finds there was 95 litres of fuel onboard the aircraft. 14 February 2014: AAIB special report finds both engines "flamed out". One of the fuel tanks was empty, while a second contained 0.4 litres. A third contained 75 litres, but transfer pumps to take this fuel to the other two engine tanks were switched off. 23 October 2015: AAIB final report finds main cause of accident to be mismanagement of the fuel system by the pilot. 24 November 2017: Fatal accident inquiry announced.